How do we get to be more like Jesus? The Bible tells us that each of us has an odor issue. That is something we never want to hear, right? No, it is not THAT kind of smell. If we are Christians, it is something wonderful. When we follow Jesus in this world, we give off an unmistakable fragrance. 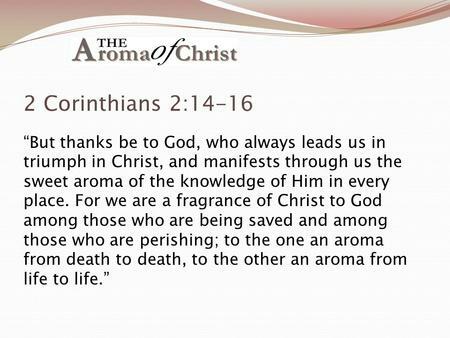 It is the aroma of Christ. With it, we announce the Lord to everyone around us. The more time we spend with the Lord, the stronger it gets. Have we ever had anyone comment that there is something different about us? Have we ever seen a person and just known by looking at them that they were another believer? This is the result of the fragrance of Jesus. People cannot help but notice something imperceptibly different. We belong to Jesus and are therefore marked as His to all the world. When we kids would run up and throw our arms around him or sit in his lap, what do we think happened? We were flooded with the smell of smoke. Not only that, but the smell transferred from him to us. We went away announcing to everyone around that we had just hugged a fireman. The smell of smoke still brings me back to sitting in his lap to this day. It was part of his identity as my dad and my identity as his child. A 5 year old smelling like a building fire testified to my closeness to my fireman dad. If we have ever been in a hothouse filled with orchids, the same feeling of being overwhelmed with an odor is present. The air seems heavy with the scent. It hits us as soon as we step into the room. The whole area is dominated by the aroma coming off of the flowers. If we spend many hours in the orchid house, what are we going smell of? The same is true with followers of Jesus. When we are spending more and more time with Jesus, it changes us. His presence rubs off on us. We end up seeming less like us and more like Him. We cannot help but exude the aroma of Jesus like it is coming through our pores. A church on fire for Jesus is like that hothouse with orchids at full bloom. The smell of Jesus is everywhere and overpowering. The closer we get to Him, the more we smell like Him. The less Jesus is involved in our lives, the lighter the aroma. Mary gives up all of her concerns about stature and propriety in order to serve Jesus. She goes so far as to use her hands and her hair to get the oil onto Jesus’ head and feet. She is at His feet serving Him with all that she has in this world. She is a simple follower of Christ doing what she can to worship the Lord. So do we see the picture that is laid out for us? The oil involved was very aromatic. 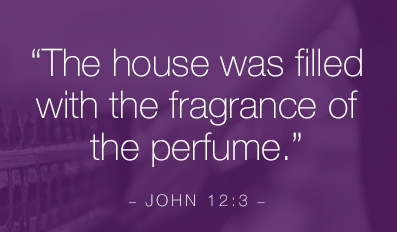 The Bible says that the whole house was filled with its smell. Jesus was covered with that oil as part of His role as the Messiah. He would have smelled strongly of it. He is the focus of the account, obviously, and we know that there is deep symbolism involved in the anointing but it doesn’t affect just Him. Mary’s devotion to serving Jesus changes her as well. When Mary gets up to leave that house, she is not the same as when she arrived. Her devotion to the Lord has changed her dramatically. She is just as covered in aromatic oil as Jesus. It is all over her hands, arms and hair. She exudes the same fragrance as her Lord. Taking part in the ministry of Jesus has left her smelling just like Him. That doesn’t just go away when her time near to Jesus ends. 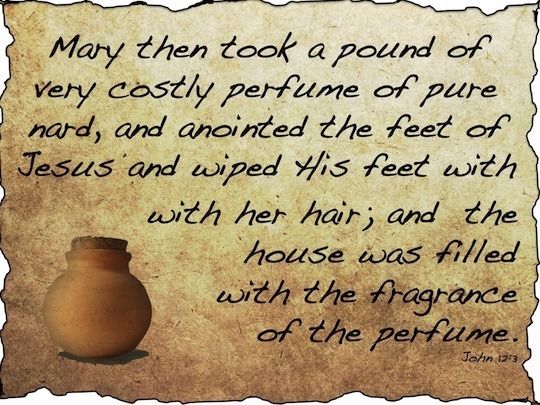 When Mary leaves His presence, she still is covered with the same anointing as Jesus. Those who encounter Mary will know immediately who she has been with. It is obvious that something unusual took place and she has been very near the Messiah. Not only that, consider the oil that covered Mary’s hands. No matter how much she washed after the anointing, that oil and aroma will still cling to her hands. Every single thing she touches after leaving Jesus’ feet will be affected by a bit of the fragrance. She will leave a trail of sweet-smelling oil wherever she goes. It is an awesome picture of our life in Jesus. We are just as changed by time spent at the Master’s feet as Mary was 2000 years ago. Serving Him and worshipping Him allows us to share in His anointing through His grace. The aroma of His ministry rubs off on us as we rejoice in His presence and it follows us wherever we go. We may not be physically rubbing oil on His feet, but when we love the world like He does we are just as intimately connected to Him. God’s Spirit fills us. His love compels us and we are changed as a result. We do not leave the presence of Jesus covered with the fragrance of anointing unless we start off in His presence. Sitting at His feet, learning from Him and serving Him are necessary components of becoming like Jesus to this lost and fallen world.